Meet Austin, an eighteen-year-old whose body is much more fragile than his spirit. Despite the painful effects of osteogenesis imperfecta--a rare disease that makes bones brittle and prone to break--and the challenges of living with autism, Austin is an overcomer who inspires everyone he meets. The Unbreakable Boy is the raucously tender story of Austin's joyful embrace of life's tragedies and triumphs. In honest, utterly real storytelling, Scott LeRette pulls back the curtain of his life to reveal personal and family struggles, from marital meltdowns to destructive bouts with addiction. The only thing that keeps Scott buckled into this ride is his growing faith in God and the conviction that he was chosen as Austin's dad. With every twist, this father-son saga breathes hope in to all of us who ever feel overwhelmed, wondering if the end of the rope we're clinging to is fraying in our hands. Austin's life is proof positive that the rope may break, but we don't have to. 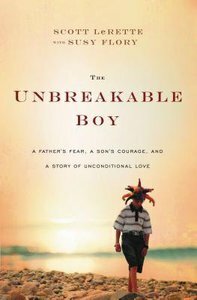 About "The Unbreakable Boy: A Father's Fear, a Son's Courage, and a Story of Unconditional Love"
The Unbreakable Boy is the raucously tender story of the life of a teenage boy with a rare brittle-bone disease who joyfully embraces life's tragedies and triumphs. Now in trade paper. In honest, utterly real storytelling, Scott pulls back the curtain of his life to reveal personal and family struggles, from marital meltdowns to destructive bouts with addiction.